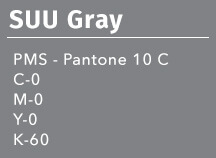 The SUU Logotype is a custom font. The University Name (Southern Utah University) typeface is Fira Sans, Medium. The print colors are provided in CMYK percentages and spot color value (PMS) for printed material. The web colors are provided in RGB and HEX color value for digital and on-screen material.